This is a living document, and will continue to be updated and revised with more stories, images, and links for additional historic content. See the Virtual Tour page for more about the current campaign. 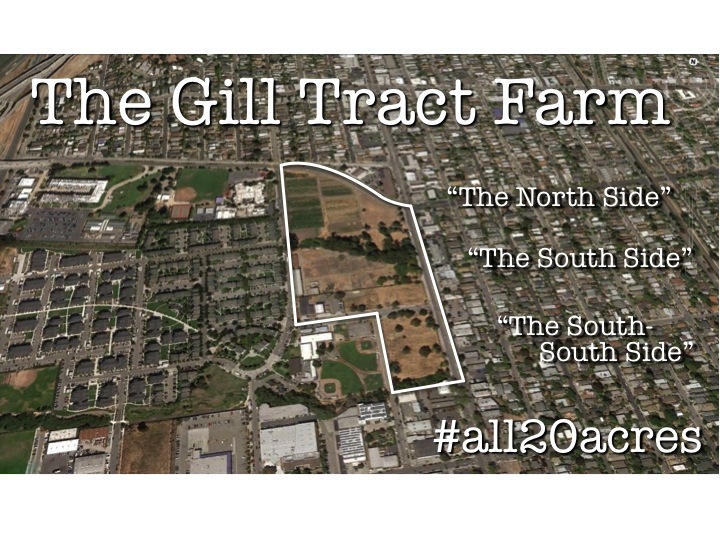 The Gill Tract Farm is the last remaining 20 acres of an historic farm the UC has owned for almost a century. Capital Projects, the Real Estate division of the University has had plan to privatize this entire piece of public land since the late 1990s, and they are imminently planning to pave over about 6 acres within the coming year. This is effectively a corporate land grab from the people. 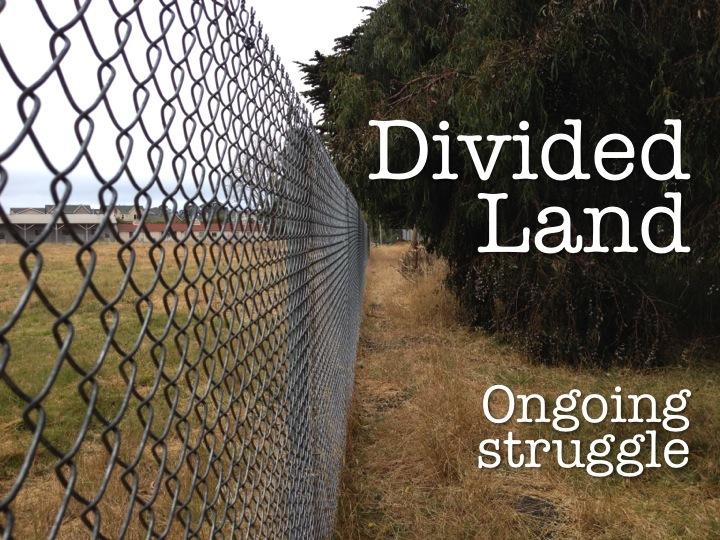 The land under the Gill Tract has a long history, and the people who have lived, farmed, taught, and dreamed here have endured repeated dispossession, silencing, and repression. Before describing the current campaign by students and community members for the last remaining 20 acres of this historic land, we would like to highlight a couple periods of this long history to situate the struggles enduring today. We recognize that the land we are fighting to reclaim today is land that was violently stolen from the original people of this area through colonization. “The descendants of the native groups who lived between the Carquinez Strait and the Monterey area prefer to be called Ohlone,’ although they are often referred to by the name of their linguistic group, Costanoan. Albany is within the former territory of the Huchuin, who spoke Chochenyo or Chocheno, one of eight Costanoan languages. Huchuin territory extended from Temescal Creek in north Oakland to Wildcat and San Pablo Creeks in the city of Richmond. 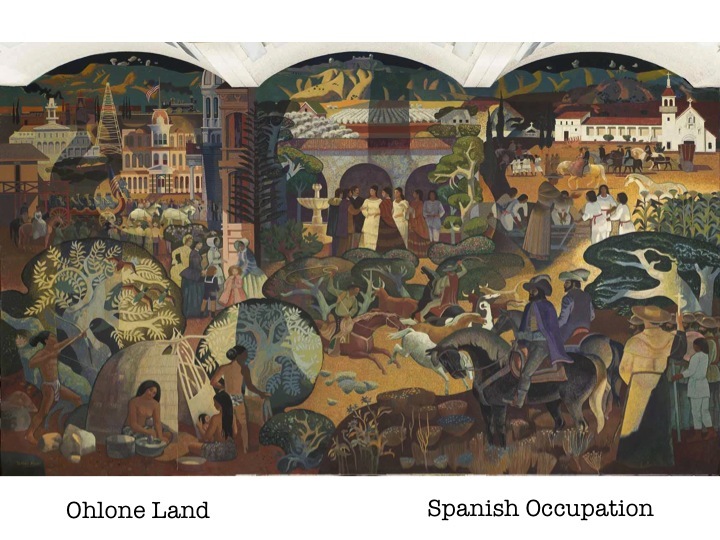 Intensive Hispanic exploration of the Bay Area began in the late 18th century, radically transforming Ohlone culture as European settlers moved into northern California. These settlers established the mission system and, exposed the Ohlone to diseases to which they had no immunity. Founded in 1776, Mission San Francisco was situated directly across the San Francisco Bay from what is today the city of Albany, and drew Ohlone from throughout the Bay Area. Mission records indicate that the Huchuin were among those native cultures relocated, sometimes forcibly, to Mission San Francisco. Following the secularization of the missions in 1833, native people in the Bay Area moved to ranchos, where they worked as manual laborers. We currently have limited information about the people who once lived on this particular land, but we are interested in receiving more of this history, and working with descendants and other indigenous communities to use this land to revive and relearn ancestral traditions and cultures. 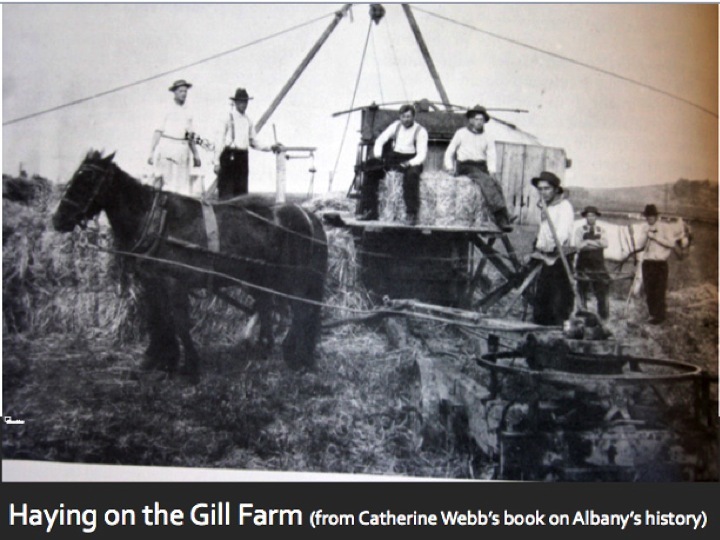 The Gill Family acquired the land in 1889, and it was used for various farming projects, a nursery, and an arboretum. 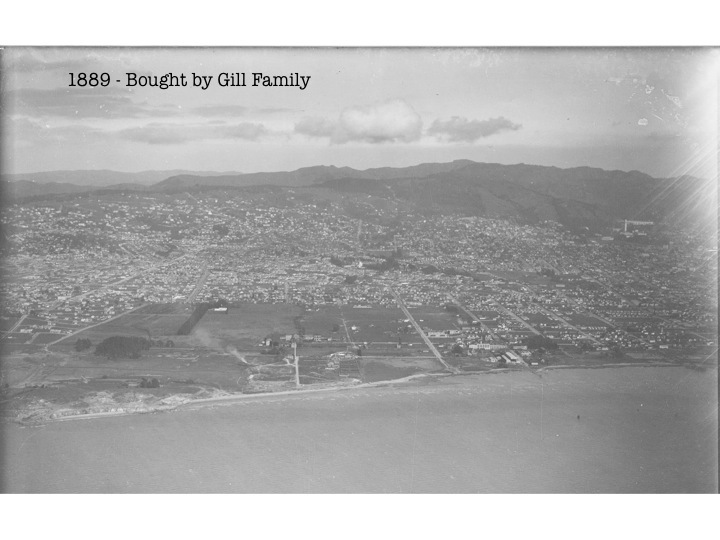 Though the Gill Tract was originally over 100 acres, it was gifted, sold, and leased by different projects over the course of the century, including for military housing during WWII. Much of this housing later became student and family housing. The star marks the approximate location of the current community farm project. 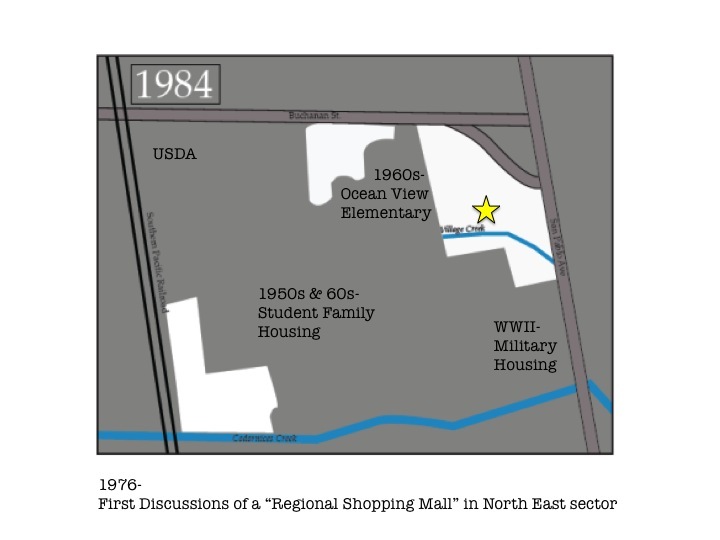 In the mid 1970s, following Reagan’s austerity governorship, there was the first mention of a “Regional Shopping Mall” to be built on the “Northeast sector” of the Gill Tract. However, this was not possible at the time because of the strength of the world-renown Biologic Control Research Station. Starting in 1945, there was a famous Center for Biologic Control on the site that was researched how insects and ecological systems could be integrated into pest management. 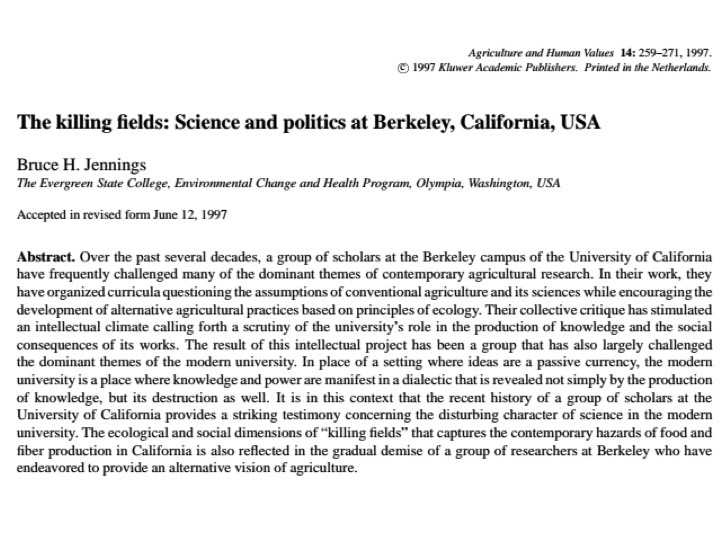 At a time when pesticides were taking off, and the culture within the University was “better living through chemistry”, this center was an important node in the fight against industrializing agriculture that endures today. 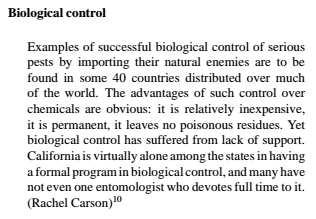 This research was an inspiration to many in the emerging environmental movement, and bolstered the anti-pesticide movements, as highlighted in Rachel Carson’s quote, above. PLOWBOY: What was it that triggered your move from scholarly work to eco-activism? VAN DEN BOSCH: It simply became clear to me that our current ideas about insect control were heading the world toward both ecological and economic disaster, and that political action was the only way we were ever going to get off our global pesticide treadmill. PLOWBOY: What do you mean by “pesticide treadmill”? VAN DEN BOSCH: I’m referring to the situation that develops when farmers are forced to use more and more insecticides every year—and pay higher and higher prices for those substances—while the natural processes of species resurgence and immunity backlash actually build up insect populations rather than destroy them. This sort of “unwinnable war” is a result of our rather silly attempts to control the more than sextillion reproductively prolific creatures—among the world’s million and a half insect species—with single-minded Buck Rogers methods. The pesticide treadmill is a long, expensive walk which can never make any real progress. 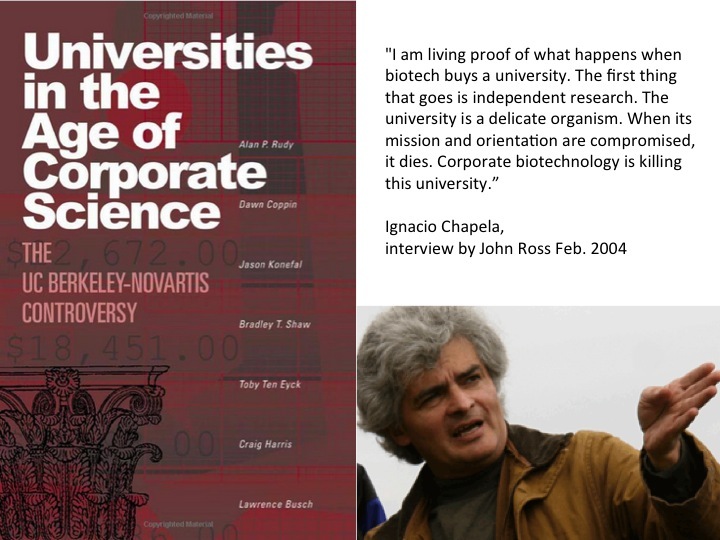 However, this center was actively dismantled by the University between the late 1970s to the 1990s in result of pressures within the University from the pesticide industry and because of the interest in attracting more corporate donations. This explored beautifully and with more depth and nuance in “The Killing Fields”, and article by Jennings, written in 1997. This transition from Biologic Control to research for the benefit of petrochemical interests and industrial agriculture came to an apex in 1997 when the department of Plant and Molecular Biology received a $25 million donation from Novartis. This sparked indignation and active protest on campus, notably from Professor Ignacio Chapela, who had witnessed the impact of GMOs on corn crops across Mexico and knew deeply what it would mean for our research to be bought by a biotech corporation. 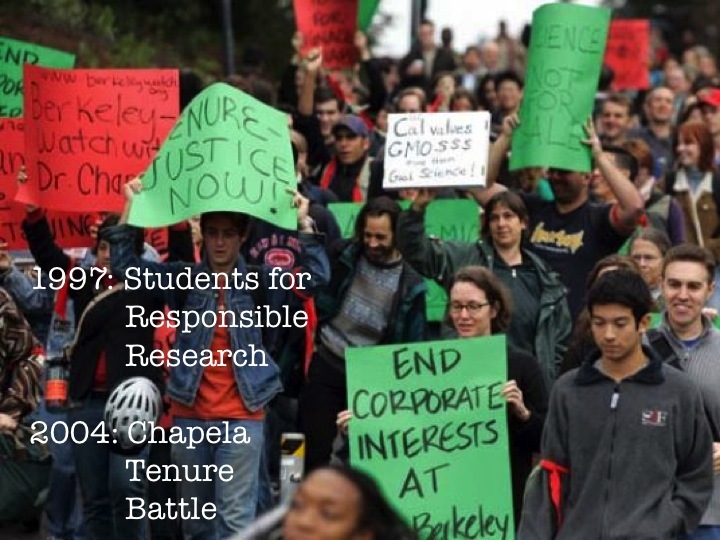 After speaking out, Professor Chapela was scandalously denied tenured directly by the Chancellor (he eventually received tenure through a vigilant and unyielding mass mobilization). Students were a powerful and active part of these struggles. Over 15 years later, petrochemical corporations continue to have a large hold on the University, as exemplified by the BP building on campus, and Professors continue to be silenced. Professor Tyrone Hayes has been targeted by the pesticide industry because of his outspokenness on his findings on the toxicological impacts of Atrazine. 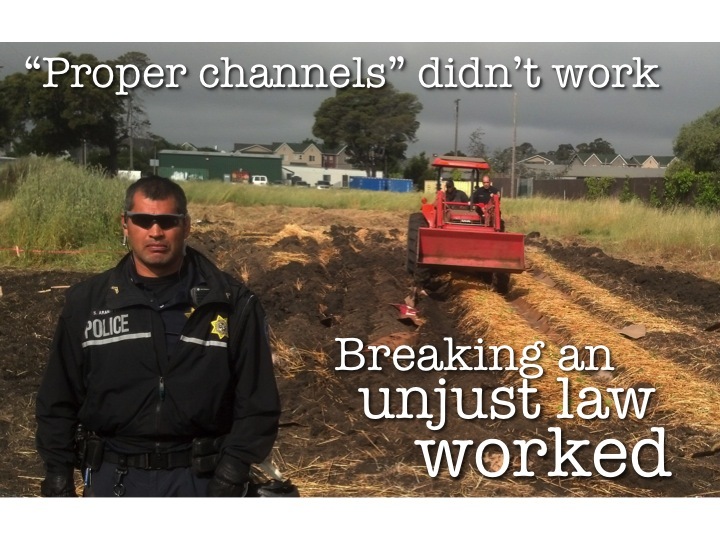 Well-known Agroecology researcher, Professor Miguel Altieri, has also been repeatedly intimidated, especially following his support of Occupy the Farm. The struggle for free speech continues to live on 50 years after the Free Speech Movement on campus, and academic freedom is just one form of speech that is continuously threatened by the privatization of the University. Meanwhile, at the same time that students were working on campus to address the issue of corporate interests at Berkeley and restore Ignacio Chapela’s tenure, community members were organizing in defense of the Gill Tract, which was already under threat of development from the real estate branch of the University. 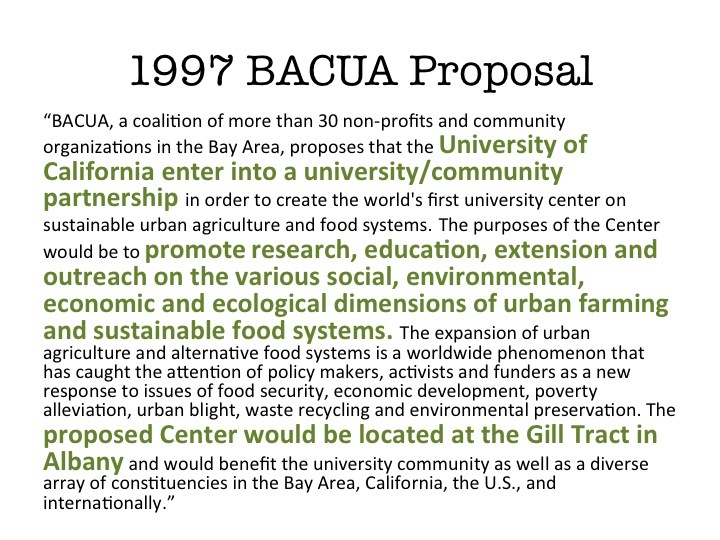 After Capital Projects made their initial plan back in 1997, a coalition of 30 community groups and many UC Professors (including Ignacio Chapela and Miguel Altieri) put together the BACUA proposal advocating for the use of the space for an Urban Agriculture Research station. Over the decades, different iterations of community and student groups kept up the fight from city council meeting to city council meeting, and while they were very effective at stalling, the project kept moved along through the system. Capital Projects likes to point out all of the opportunities that the community had to give comments on the proposal- but they do not highlight the fact that at these meetings there was significant community opposition to the project. While Capital Projects has ostensibly made opportunities for the community to voice its opinion, it has not listened to this opinion. In 2012, there was a community referendum with over 1000 signatures from local neighbors and Albany Residents, gathered in just two weeks, who wanted to put the development agreement to a public vote. Capital Projects threw out the development agreement, an inessential part of the development plan, and so the project was never put to the vote that local community members democratically called for. Throughout the decades, students have also raised their voices against the development. The Gill Tract is an important part of our campus, and yet student needs for research and education have been continuously ignored in this development project. This 2004 letter from the Student Organic Garden Association highlights the student interest in keeping this land intact for student use. 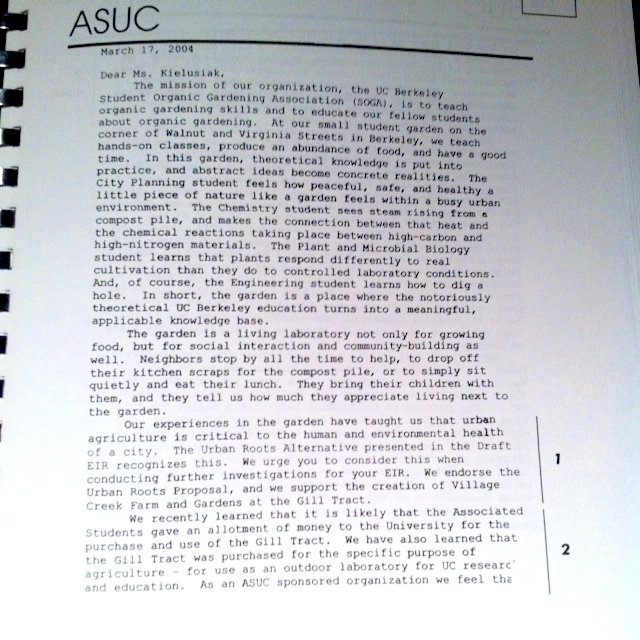 Ten years later, the Associated Students of the University of California (ASUC), is still in favor of a halt to the development: SBNo.84ABillinSupportofPreventingDevelopmentoftheGillTractFarm. In 2004, when Urban Roots was struggling for this land, the community members wanted to see the old Gill home used for a historic museum, as shown in this image from a pamphlet showcasing the community visions for the land. 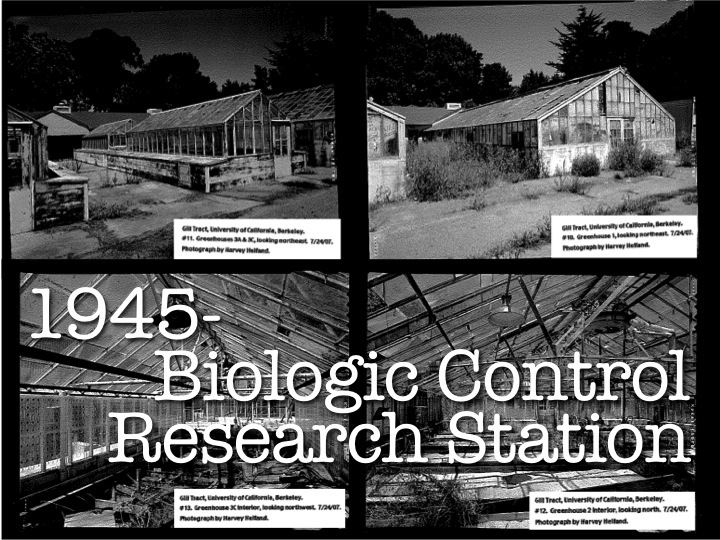 However, in 2007, the historic home was demolished, along with the greenhouses, labs, and classrooms from the Biologic Control Research Station. 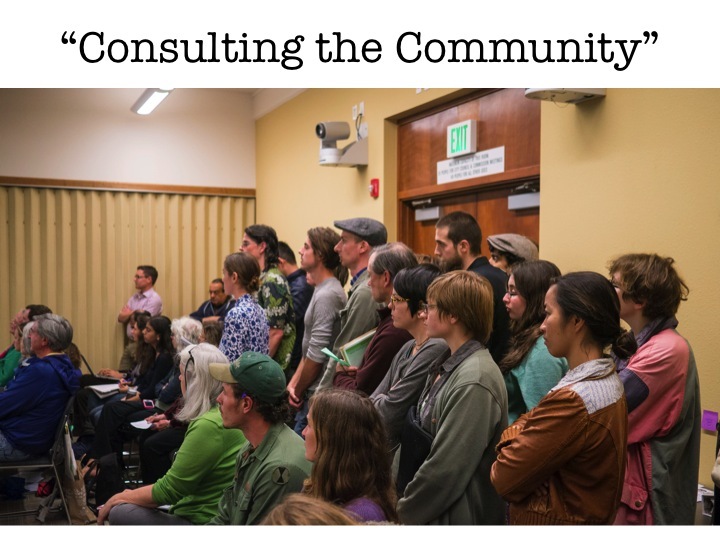 While this was demoralizing to many in the community, the story of the tract continued to live on, and was passed down year after year through classes at Berkeley, including Agroecology researcher and Professor Miguel Altieri, who collaborated with the Biologic Control research station. Former students from these classes took these stories and lessons with them as they graduated. 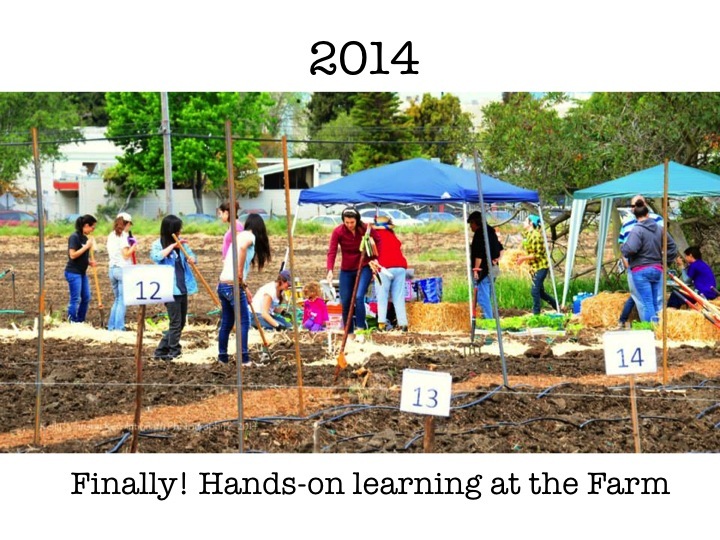 Then in 2012, inspired by the Occupy movement, a community group including former Berkeley students, taught under Miguel Altieri, created “Occupy the Farm”. 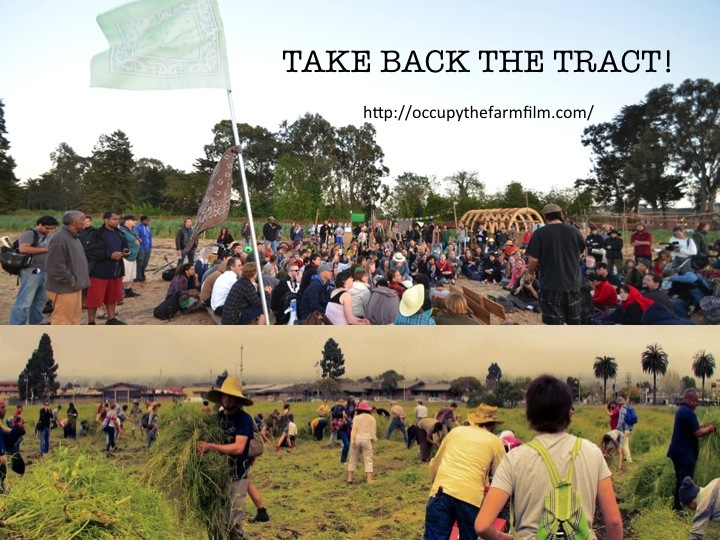 On Earth Day, 2012, OTF led a high profile act of non-violent civil disobedience by breaking the locks at the Gill Tract, planting a large plot of the land, and setting up an encampment to defend the crops. 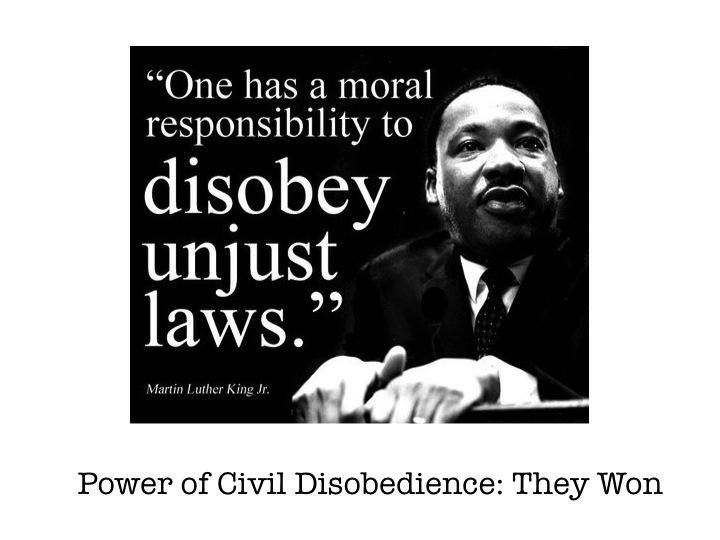 In a political moment (Occupy Wall Street) conducive to rule breaking, and a historical situation where the land-managing UC lacked legitimacy in the eyes of locals, OTF was well positioned to try something different; civil disobedience wasn’t just a tactic pulled out of a hat. OTF critiqued all sorts of issues pertaining to food sovereignty by occupying ostensibly “public” land that was off limits to the public, and combining this action with legal, political, and media campaigns (members also filed EIR lawsuits and ran for Albany council). The protests highlighted the development of farmland; biotechnology; lack of democracy in the UC; misallocation of research and extension resources; and lack of opportunities for participation in local, public, or commons land management. OTF even used the platform of their successful action to highlight the dispossession of indigenous people from the very land they were “occupying”. Read more about this and OTF’s alignment with the global movement for Food Sovereignty in this year’s Disorientation Guide. On February 26, 2015, UC Berkeley mandated the destruction of 60 trees, many of them rare and over a century old, the first step of development. Defense of this soil is more important than ever, and SEAL and OTF continue to work in opposition of the development plans. 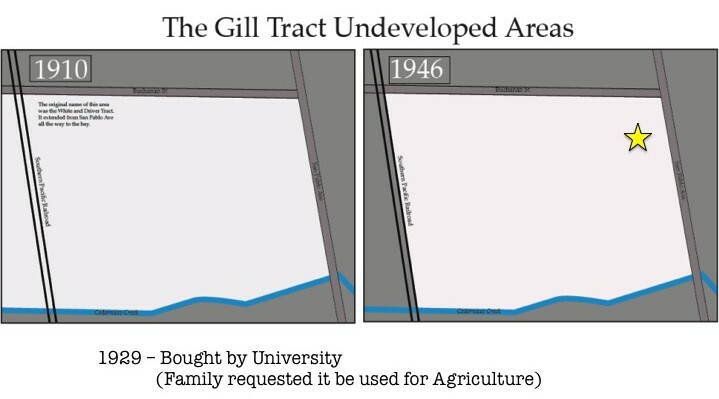 The Gill Tract Farm has been the site of some very important research with political implications, and this history is also in danger of being lost and rewritten. That is why we are calling on the University to halt the development, and develop a Food Initiative on all 20 acres of this historic farmland that is currently open greenspace.